Ozhotels provides business and leisure travellers with a directory of independently owned and non-related hotels and serviced apartments providing accommodation in East Melbourne. Oz hotels allows you to deal directly with the hotels and apartments in East Melbourne, hence giving you the best possible rates for this luxury and budget East Melbourne accommodation. Book your accommodation online directly with the hotels in East Melbourne and receive discount rates for longer stays !!! 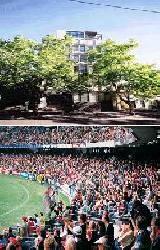 East Melbourne is a quiet, leafy suburb situated on the edge of the city centre, just 1km from the Melbourne CBD. Probably Melbourne's earliest suburb, East Melbourne has been affluent since the time of the great Victorian gold rush and now features some of the largest and oldest Victorian homes and terrace houses in Melbourne. East Melbourne is home to most of Victoria's government institutions, Parliamentary and Treasury Precincts and St Patrick's Cathedral. 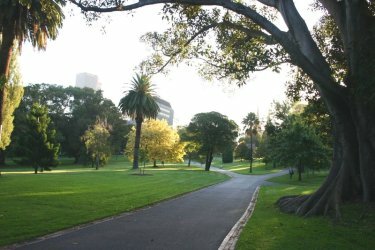 It also has some of the city's finest parks and gardens such as the Treasury Gardens and Fitzroy Gardens. East Melbourne is probably best known for the world famous Melbourne Cricket Ground (MCG) and is faithfully serviced by major tramlines connecting to the CBD on Wellington Parade and Victoria Parade. 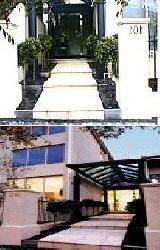 Due to its quiet location and close proximity to a number of hospitals including the Royal Victorian Eye and Ear Hospital, Freemasons' Hospital, Peter MacCallum Cancer Institute, St Vincent's Hospital and St Vincent's & Mercy Private Hospitals, East Melbourne is the ideal accommodation for family members visiting a sick loved one. Quest Jolimont is ideally placed for business travellers, shoppers and sporting fans being just 200m from the iconic MCG and 500m from Rod Laver Arena, Melbourne and Olympic Parks. 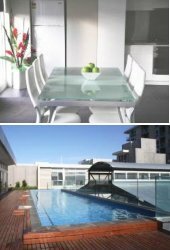 Quest Jolimont provides 1 and 2 bedroom self contained serviced apartments in East Melbourne that are both superbly appointed and spacious. Situated on Wellington Parade South the Quest Jolimont is close to some of Melbournes greatest attractions including CBD shopping, Richmond cafes, Telstra Dome and Docklands all just a short tram ride away. 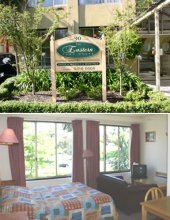 Quest Jolimont East Melbourne accommodation is a quality alternative to traditional places to stay, offering guests a spacious apartment for the price of a hotel or motel room. Quest Jolimont offers a wide range of guest services including pantry shopping, valet dry cleaning, restaurant chargeback, secretarial service, baby sitting service, tour desk, undercover car parking and free use of the gym facilites at the Corporate Health Club. 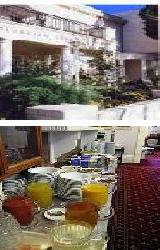 There is also a raft of business services available for the corporate traveller at the Quest Jolimont. Perfectly positioned just 1.5 kilometres from the city centre of Melbourne, the Adara East Melbourne a selection of studio apartments and one bedroom apartments at very affordable prices. This exceptional value for money accommodation in East Melbourne also provides complimentary on site car parking for guests and a wonderful central location with all of the apartments within easy walking distance of the MCG, Fitzroy Gardens, Bridge Road discount shopping and public transport. The location for the Quest Apartments in East Melbourne is second to none. It is nestled away in quiet East Melbourne only 200m from the MCG, 500m from the Rod Laver Tennis Arena, 900m from the CBD and a short stroll away from Bridge Road with it's many factory outlets and cosmopolitan cafes. This central position along with public transport on your doorstep makes this accommodation in East Melbourne perfect for business travellers, shoppers and sporting fans alike. The Quest East Melbourne is a 3 level property on Wellington Parade that provides guests with the choice of either open plan, family & executive style studio apartments. All of the apartments in this East Melbourne accommodation have been recently refurbished to the highest standards and include air conditioning and high speed broadband internet. There is even a roof top garden and courtyard for all guests to enjoy. The City Edge Serviced Apartments provides exceptional discount rates for both short and long term stays, which makes it the perfect accommodation in East Melbourne for corporate business travellers and leisure guests alike. City Edge offers a range of one and two bedroom fully self contained serviced apartments which are ideally located in leafy suburb of East Melbourne. City Edge provides comfortable and convenient apartment accommodation close to the Melbourne CBD with easy access to public transport, laundry facilities and free on site car parking available. This discount accommodation in East Melbourne is within walking distance of the city centre, MCG, Melbourne Tennis Centre, Dallas Brooks Centre and Bridge Road discount shopping. 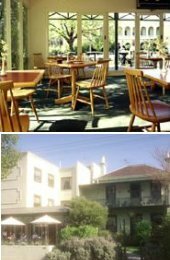 The Georgian Court Bed and Breakfast in East Melbourne is ideal for those travelers who prefer traditional B&B accommodation in a beautiful tree lined street within easy walking distance to the hustle and bustle of the Melbourne CBD. Georgian Court Bed and Breakfast is conveniently located in historic East Melbournee, which is said to be one of Melbourne's most beautiful and charming areas. Georgian Court Bed and Breakfast East Melbourne is perfect for tourists who want to be close to all the exciting attractions in the heart of Melbourne, business travellers staying overnight for a conference or people visiting patients in Melbourne's major Hospitals. 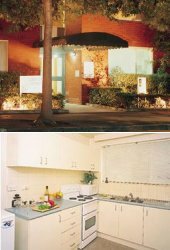 The relaxing home away from home atmosphere of this grand Terrace House is much more personal to the typical inner city hotel accomodation. Georgian Court B&B East Melbourne is ideally located within walking distance of the Melbourne City Centre, Tennis Centre, Olympic Park, the Entertainment Centre, Melbourne Cricket Grounds, Botanical Gardens, Fitzroy Gardens, Major hospitals and the Theatre District. There is also a wide selection of restaurants and shops located nearby on Wellington Street and cosmopolitan Bridge Road, Richmond. The Knightsbridge Apartments offer both business and holiday travellers the choice of superbly finished studio apartments or the more spacious family suite. Both of these self contained East melbourne accommodation have wireless internet, air conditioning, well equipped kitchenettes and many more facilities to make you feel right at home. The Knightsbridge Apartments are ideally located in one of the city's most favoured locations, East Melbourne. The leafy green surroiundings provide a relaxed atmosphere just 5 minute stroll to the cosmopolitan Bridge Road in Richmond with it's many fashion outlets, restaurants and cafes. The Knightsbridge Apartments is also withing easy walking distance to Melbourne's major sporting attractions including the MCG and the Rod Laver Tennis Centre. A short stroll through the beautiful Fitzroy Gardens from this discount accommodation in East Melbourne will place you in the heart of the city centre. The Magnolia Court Boutique Hotel is a charming, family-run hotel located in leafy East Melbourne, just a short distance from Melbourne CBD. Magnolia Court Hotel provides classic old world charm with bed and breakfast accommodation in a range of hotel suites, family suites, apartments and even a unique cottage. This stylish accommodation in East Melbourne is a leisurely walk away from the MCG, Rod Laver Arena and Fitzroy Gardens, with public transport to the Melbourne city centre nearby. Relax in style in this East Melbourne accommodation with discount rates available for longer stays. The Tribeca Serviced Apartments are a new addition to the East Melbourne region and with its modern, stylish furnishings provides the perfect luxury apartment accommodation in East Melbourne. Guests can choose from 1 and 2 bedroom boutique executive apartments just 1 km from the Melbourne city centre. The Tribeca Serviced Apartments really does offer excellent long and short term accommodation for the corporate executive or family holiday, complete with free secured car parking and easy access to public transport. 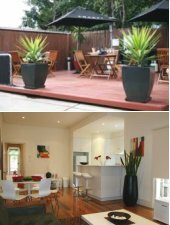 The Birches Serviced Apartments is a very popular apartment and townhouse accommodation that is located in the heart of tranquil tree-lined, historic and fashionable East Melbourne. 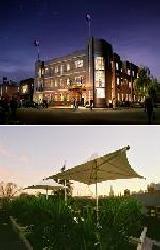 Stay in one of Melbourne's most exclusive areas which is renowned for its beautiful parks and gardens. This quality apartment accommodtion in East Melbourne is only minutes from the Melbourne city centre and have been beautifully furnished with an open, bright and fresh modern feel. The Birches Apartments East Melbourne has been designed with comfort and convenience in mind and featuring quality furnishing including a modern fully equipped kitchen, queen size beds, private ensuite bathroom, reverse cycle air conditioning/heating and high speed internet connections.